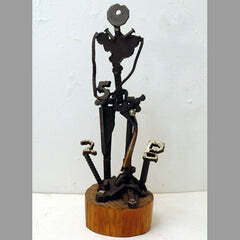 The figure itself is flame-cut steel and welded scrap metal, and stands on a circular pine wood base. Its conception stems from my interest in Candomblé—the Brazilian form of voodoo—and my wish at the time I made it to put some mojo out there to extend the length of my month-to-month lease on my amazing cheap studio in a former gas station on NYC's Lower East Side another 5 years. That is why the figure holds a number 5. I guess it worked as I was able to keep the studio another 10 years!